Our fieldtrip in Sicily captured the attention of the Italian media while we were there. 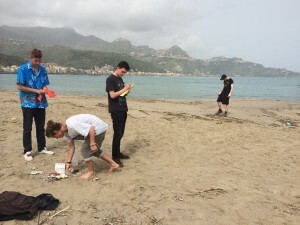 Five of our group, Rob Arnold, Paddy Nolan, Tom Amey, Richard Higham and Harry Ward were examining the types and origins of waste at Giardini Naxos but also wanted to do something to help improved the environment for beach users and local wildlife. So they organised a clean-up in the area, collecting over 1,500 pieces of litter, including pieces of plastic, glass and fishing lines. One local, Salvatore Ferrara, who is also an environment volunteer, was passing by when he saw them collecting rubbish samples near Capo Schiso. Impressed by their efforts to clean up, he got in touch with local media to inform others about what the students were doing for the area. La Sicilia, a local newspaper, then interviewed Rob, Paddy, Tom, Richard and Harry about the trip, photographing them working on the beach and including them on the front page.